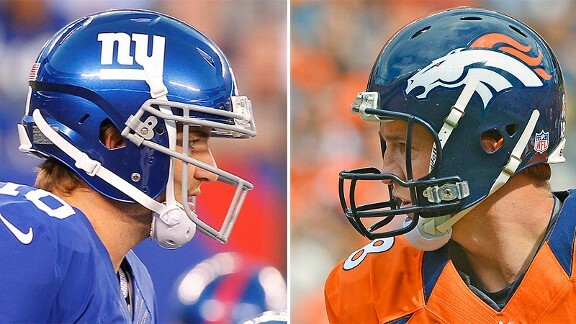 Manning Bowl III belonged to big brother Peyton yesterday as the Denver Broncos defeated the New York Giants 41-23. It was a slow start to the much anticipated game. The Broncos were only up 10-9 at the half. Then Denver came out like a whole new team in the second half, and that’s when the Giants really fell apart. The Broncos running game was on fire. Knowshon Moreno rushed for two touchdowns and 93 yards on just 13 carries. Peyton did not need to throw a record seven touchdown passes to win as he did in week one, although he did connect with Julius Thomas and Wes Welker for two touchdowns. Peyton was 30 for 43 with 307 yards and no interceptions, while younger brother Eli was 28 for 39 with 362 yards and four interceptions. Peyton has defeated his younger brother Eli in all three NFL games between the siblings, but this is sure to be the last unless they meet up back in New York in the Super Bowl on February 2nd.